Someone try to justify this. Discussion in 'Political Opinions & Beliefs' started by ErikBEggs, Mar 6, 2014. What is the explanation of this? Are 99% of people not working hard enough? This is just my opinion, but looking at your Table 1 a couple of things pop out. When the economy is going good, it's the top 1% that make the most money, and when it goes south they're the ones who get hurt the most. Why? Cuz they have the most money invested, when the market goes up they do very well and when it goes down they lose a lot of money. It ain't a question of working harder, it's an issue of making your money work for you. Most people don't have enough money working for them and they are not reaping rewards as a result. LibertarianFTW and (deleted member) like this. You and I are on the same side of this one. I can't explain it, but it's proof of what we've been talking about on various topics regarding the majority of wealth going to the top with the worker getting little. If this chart included those increases and decreases relative to inflationary costs, the picture would be even worse. Bottom line...greed. Corporations blame the economy for keeping wages for workers low while enriching top executives to exorbitant levels year over year. No explanation. Oh, and by the way I noticed your table is before taxes and does not include gov't transfers. Isn't that a bit misleading? Government stifling the rise of new competition in the markets through regulation and taxation. Established competitiors (the 1%) have a huge advantage. The late 70s are when the regulatory avalanche began. Iriemon and (deleted member) like this. Regulation has a bigger effect than taxation. Get this through your head...no further taxation (on anybody) is acceptable. Take your vile envy and pound sand. I'm going to need some evidence other than taxcutter says so. IMO there's nothing to explain...this is the diversity of actions by workers and investors. If someone is on the bottom rungs then what is keeping that someone from achieving more? Does a high school graduate earn more than a drop out...typically yes. Does an under-graduate earn more than a high school graduate...typically yes. Does a worker with a graduate degree earn more than an under-grad...typically yes. Does someone with a PhD earn more than all of the above...typically yes. Does a business owner/CEO/manager earn more than the no-skilled and lower-skilled workers...typically yes. Does a person who abuses alcohol, tobacco, drugs and gambling accumulate more or less wealth than those who don't...typically no. Does a person with a felony conviction earn more or less...typically less. This is not rocket science and it does not require an astrophysicist degree to get ahead in life...all it takes is step by step achieving more, making better decisions, focus on stuff which allows improvement, avoid everything that detracts from moving ahead to achieve one's goals. When did redistribution of income become a legitimate function of either government or taxation? Since big business (takers) started making money at the expense of the workers (makers). When poor people start to join unions and communist party. Simple enough. Do you want to see it coming? So basically as I'm interpreting your response and my graphs, NINETY NINE PERCENT of Americans are lazy and need to work harder to be like the 1%? Obama's economic policies are designed to show that the 1% are greedy and oppress the 99%. This is all a political construction and not reflective of reality. If we can manage to elect a president who will allow the free market with safety nets then we will see these #'s dramatically reverse. Just think of where we would be if Romney had been elected? Poor people in unions? So what? Poor people in the Communist Party? What's new about that? No matter how much the the top 1% have or earn, there is never a limit on how much you or anyone can have or earn. It's awesome, right? When your neighbor earns a buck, congratulate him. Don't feel that there is one less dollar out there for the rest of us. What is your solution, socialism? Knock down the top one percent? How will that then cure "income inequality?" I think if the top income earners are "knocked down" then what will follow is less income for the 99%, as shown in the graph, under Clinton. Know what I think? The "free" trade agreements which sent our manufacturing jobs overseas is primarily responsible. Both parties did this. We are on a steady economic decline, but no one has addressed why the big corporations are reaping the reward while small business owners lose their businesses because of unfair competition from the likes of Wal-Mart and other mega-corporations. It seems we are now a service based economy, and ripe for socialist manipulation. Both democrats and republicans need to pull their head out of their asses and for once do what is right for the American people. Otherwise we will become more dependent on government, they will gain more and more control over us as they ration out services and necessities we used to be able to provide ourselves with. They're NOT HURT AT ALL, since even when their income dives 50% they still have 2-3 times more on average, so they CAN'T be hurt, they are still ahead, so F 'em! Boy that bottom says it all doesn't it? 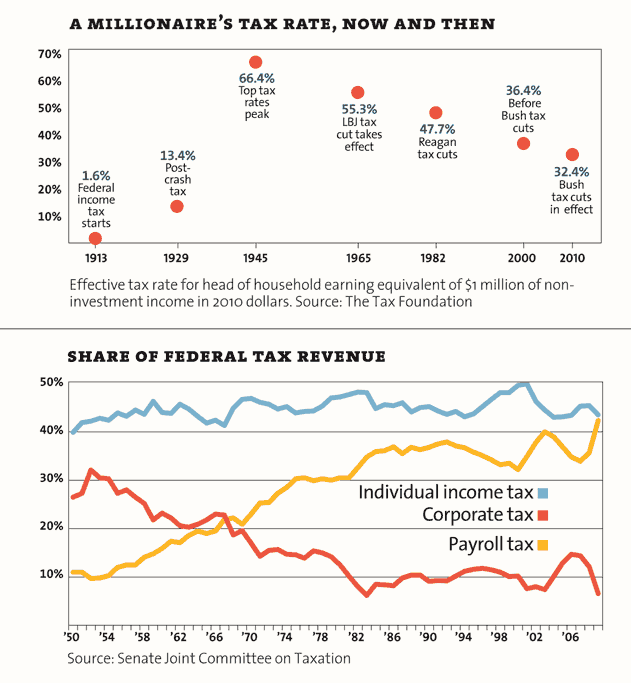 We've replaced tax revenues of corporate taxes, which mostly comes out of the pockets of the richest, with the payroll tax, paid by the middle/poorer classes. 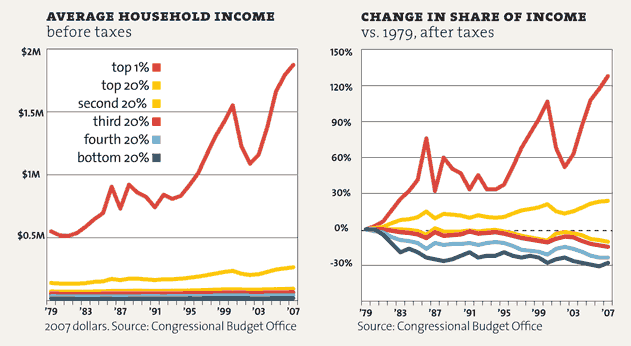 What happened in 1981, when inequality took off? Sure. Since 1981 the 1% has worked twice as hard and everyone else got lazy. Trickle down had nothing to do with it.